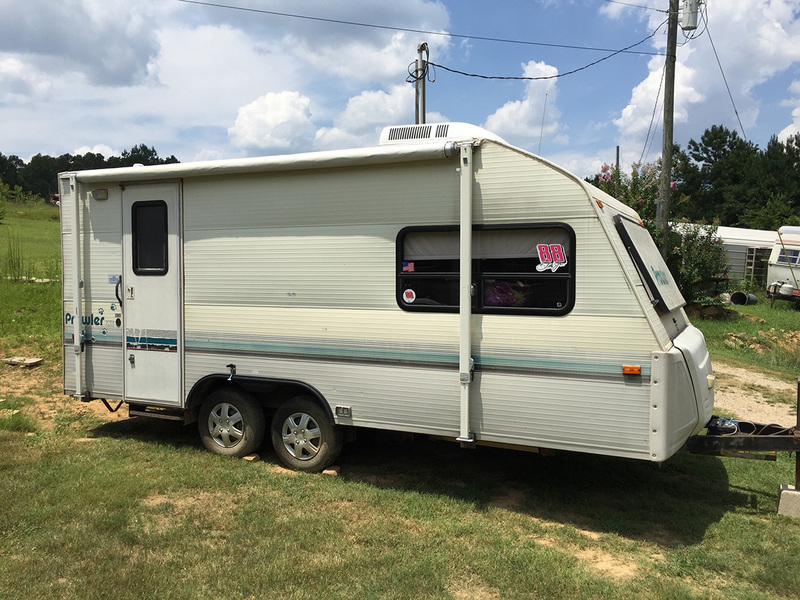 A camper, travel trailer, RV… not my normal remodel. That, plus working for my most annoying client – ME – made this not an ordinary woodworking project. Ok, it really wasn’t that bad – just took us by surprise. The though – to get a “cheap” camper to just get away. Take a quick weekend when time was available. Not a lot of planning needed, which with our busy schedule lately, is a good thing. I did say that was the thought, right. Anyway, go back about a month and I found this pretty sweet 1993 Prowler camper on Craigslist. Had a good price, so we set off for Pell City, AL to check it out. First glance, she looked nice – old, sure, but decent. I checked what I thought I knew about – the frame, GOOD, the A/C, GREAT, the roof, TERRIFIC. So, on to the inside. The kitchen was even in decent shape and the furniture too – old blue fabric (not our fav), but hey, no tears or stains. Carpet was original, so we knew we’d swap that one day, but all-in-all, she looked pretty clean. So, with our novice experience in campers, handed over the green, hooked her up and dragged it home. 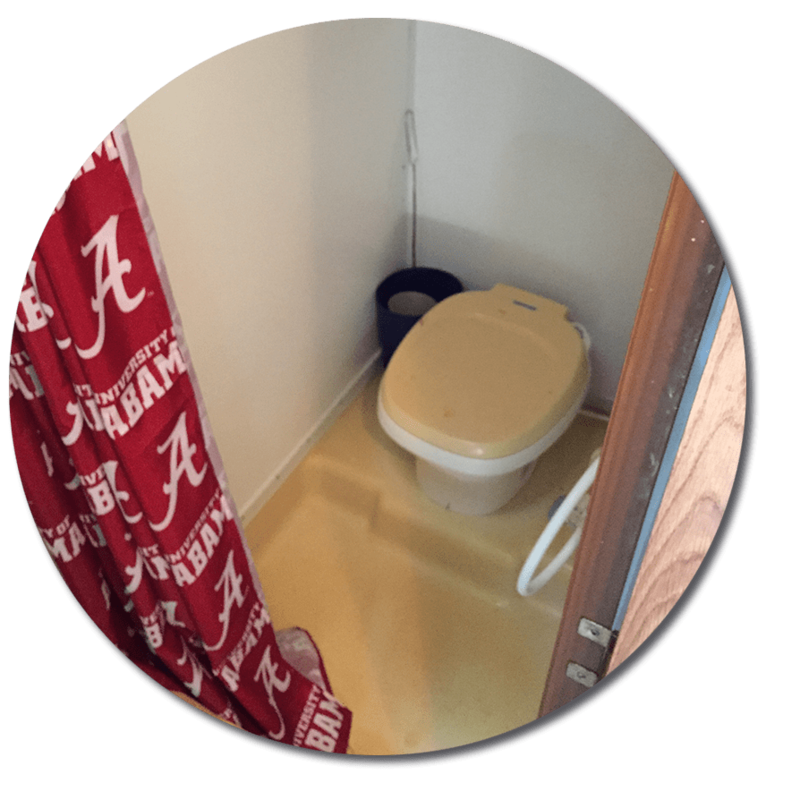 Wait, did I mention the toilet was IN the shower – no, didn’t think I did. Once home, we decided to give it the once over – clean the kitchen and bath, take notes on what we wanted to do to make it our own. My girlfriend thought – wouldn’t it be great to redo the floors – take out that 23 year old carpet and give it a fresh look. I’m all about remodeling, so of course I’m all in. We go to the Home Depot and picked out some vinyl plank flooring we liked and ready for the installation tomorrow. Tomorrow comes and out goes the carpet. Ok, not without much struggle – this stuff is glued down good. Some scraping, pulling and descriptive words later, we have a nice tacky floor to work on – that was not fun either. But, here of course comes the first problem. The walls and floors of the first 1/4 of the camper are completely rotted through. Like poke your finger type rotted out. We guess the carpet held it together for the 2 hour drive home – not sure what else. A camper is not built like a house – something I’ve been used to renovating for many years. No, its built backwards – inside out. First the frame is built – in this case, 2×2 scraps of lumber. Then the interior walls are attached (paneling usually), then the cabinets and fixtures (screwed thru from the outside), then the final aluminum exterior wrap. This is all well and good in the factory, but when it comes time to remove a cabinet, change out the ugly paneling or remove a bench, its a nightmare. After finding and cutting out the screws and staples from the inside and bringing it down to the raw studs, now I have something I’m familiar with – a shell. It really only took a couple weekend and I mention the A/C worked, right – you KNOW I had that thing plugged in and pumping. So, it could have been worse and it all came out pretty nice in the end. We took our first trip to Lake Guntersville State Park (you can read more about that here), and it performed wonderfully and fun was had by all. Well, all meaning me and my girlfriend – being that its tiny, not much more would fit.